The husband of the democratic presidential nominee is on the campaign trail. Aaron Payne reports a big part of the former commander-in-chief’s speech in Ohio yesterday (Tue) dealt with revitalizing the economy in Appalachia. 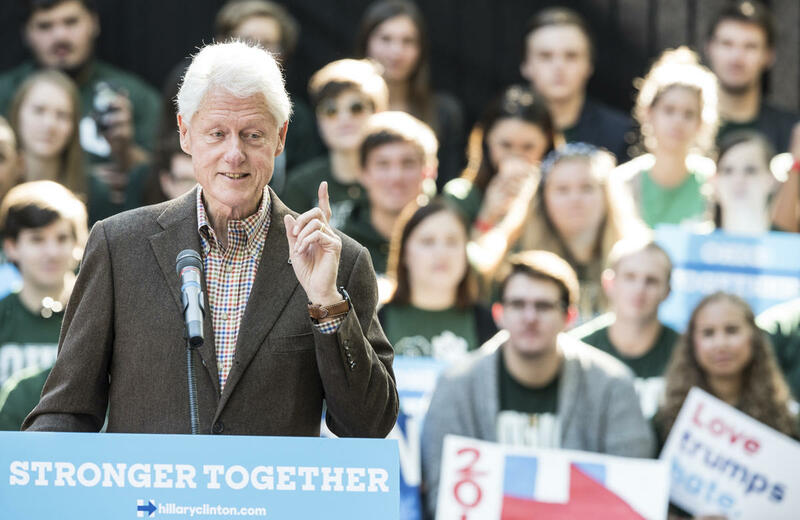 President Bill Clinton kicked off his Ohio leg of the “Stronger Together” bus tour on the campus of Ohio University in Athens. Athens resident and West Virginia native Barbara Fisher waited in the unseasonably warm weather to hear more about Hillary Clinton’s plan to stimulate the economy in rural Appalachia. President Clinton says the Ohio Valley region has a role in moving the country forward, especially when creating modern manufacturing jobs tied to making the country energy independent. CLINTON: Hillary wants to put up a half a billion solar panels over the next four years. And the fact that this is the biggest market in the world means we should be bringing back manufacturing jobs. The race for President in Ohio is tight. According to FiveThirtyEight’s Polls-only forecast, Clinton currently trails Republican challenger Donald Trump by one percentage point. Alison Lundergan Grimes is using a little star power on the campaign trail. Former President Bill Clinton Wednesday made two stops in Kentucky with the senate hopeful. Immediately after taking the stage at the Carrick House in Lexington, Grimes made it clear to the large, enthusiastic crowd that she rejects any labels her opponent Senator Mitch McConnell has tried to give her. Grimes said there is a brand she will be gladly accept. “One label, though that I will proudly wear is that of a Clinton Democrat. I am a Clinton Democrat,” said Grimes.